Want to Buy your APPLE Watch Nike Series 3 Cellular 42 mm Silver later? Unleash your run. Two of the worlds most innovative brands have taken their long-running partnership even further. With built-in cellular, GPS and altimeter, Apple Watch Nike+ now lets you train with in-ear coaching, stream 40 million songs, and receive notifications ; even when you dont have your phone. The perfect running partner just got better. Plus, with a water resistance of up to 50m, always be ready for a pool or ocean. Currently, cellular service for Apple Watch Series 3 (GPS + 4G) within the UK is only available on the EE network. Youll need to be on a consumer pay monthly or SIM-only contract, and be the lead name on the account. An additional credit check will be required. For any queries, please contact EE by dialling 150 from your EE phone. 16GB memory. Connectivity iOS operating system. Bluetooth 4.2 connection. Wi-Fi. Display information AMOLED screen. Touchscreen. Battery Typical usage time of up to 1 day. Low usage time of up to 1 day. Physical specification Size H42.5, W36.4, D11.4mm. Weight 34.9g. Features Water resistant. Dust resistant. Answer calls and make calls. Read texts and reply to texts. Read emails and reply to emails. Receive social network notifications. View calendar. Displays weather. Music player. Heart rate monitor. Pedometer. Accelerometer. Accessories included: Case, Band, 1m Magnetic Charging Cable and 5W USB Power adapter. How to buy Brand New APPLE Watch Nike Series 3 Cellular 42 mm Silver through Phone Retailers? Phone Retailers compare prices of APPLE Watch Nike Series 3 Cellular 42 mm Silver with hundreds of retailers. You simply need to select the best price of APPLE Watch Nike Series 3 Cellular 42 mm Silver from one of the retailers. 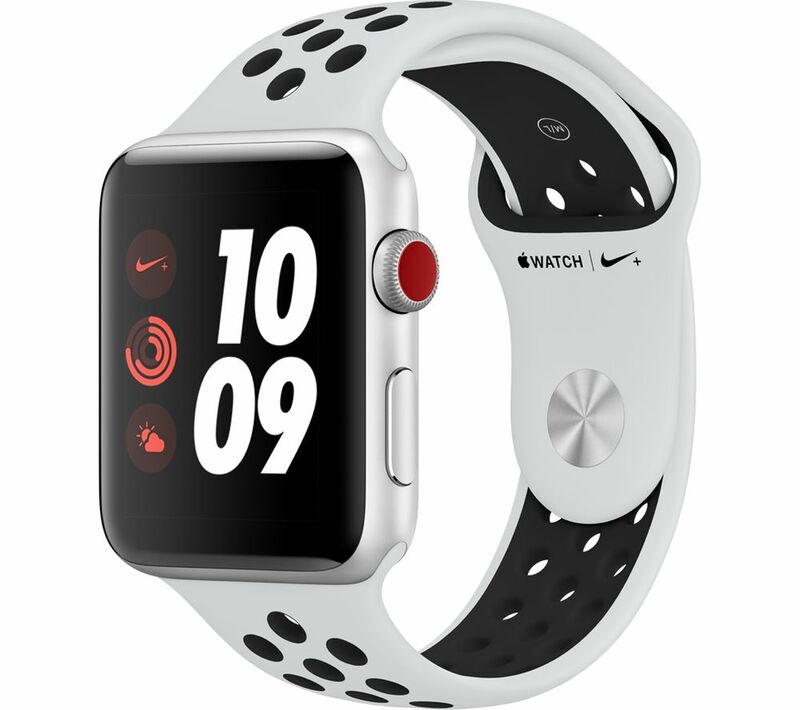 Once you have found the cheapest price for APPLE Watch Nike Series 3 Cellular 42 mm Silver, proceed on to the seller's website to complete checkout process and make payment online for APPLE Watch Nike Series 3 Cellular 42 mm Silver. Complete the checkout process for APPLE Watch Nike Series 3 Cellular 42 mm Silver and wait for delivery of your order. Make sure someone is available to sign for your delivery. How to find out the best deals for APPLE Watch Nike Series 3 Cellular 42 mm Silver? We list the retailers based on their price offer for APPLE Watch Nike Series 3 Cellular 42 mm Silver, reviews, ratings, delivery time and method. You can select the retailer suited to your preferences. Can I compare APPLE Watch Nike Series 3 Cellular 42 mm Silver prices online? What is the cheapest offer on APPLE Watch Nike Series 3 Cellular 42 mm Silver? Cheapest Price of APPLE Watch Nike Series 3 Cellular 42 mm Silver today is £429.00 offered by Argos whereas the highest offer is £429.00 by Argos. You can save approximately £0.00 when you buy Brand New APPLE Watch Nike Series 3 Cellular 42 mm Silver. Can I buy APPLE Watch Nike Series 3 Cellular 42 mm Silver and pay online? How long will it take to get my APPLE Watch Nike Series 3 Cellular 42 mm Silver delivered? Shipping methods and delivery time is different with each merchant. You can check on APPLE Watch Nike Series 3 Cellular 42 mm Silver listing next to the retailer, their dispatch time and payment methods. Is it safe to buy APPLE Watch Nike Series 3 Cellular 42 mm Silver online? We can assure that it is totally safe & secure to purchase APPLE Watch Nike Series 3 Cellular 42 mm Silver online with Phone Retailers. The retailers affiliated with us are verified and trustworthy. How to get the best price for APPLE Watch Nike Series 3 Cellular 42 mm Silver and choose the best retailer selling it Online? I want to buy a brand new APPLE Watch Nike Series 3 Cellular 42 mm Silver. How much can I buy it in Brand New condition for? Argos and 0 other retail is selling APPLE Watch Nike Series 3 Cellular 42 mm Silver for as low as £429.00 in brand new condition. You can also check the price for refurbished APPLE Watch Nike Series 3 Cellular 42 mm Silver. How many APPLE Watch Nike Series 3 Cellular 42 mm Silver can I buy in brand new condition online? You can check on retailers website to see how many brand new APPLE Watch Nike Series 3 Cellular 42 mm Silver they have in stock and order APPLE Watch Nike Series 3 Cellular 42 mm Silver directly on their website. How easy is it to buy a brand new APPLE Watch Nike Series 3 Cellular 42 mm Silver through Phone Retailers? It’s a very simple process, we compare you the best prices for a brand new APPLE Watch Nike Series 3 Cellular 42 mm Silver so that you can check how much does it cost online. Once you choose the most suitable retailer, all you need to do is add APPLE Watch Nike Series 3 Cellular 42 mm Silver to the basket and complete their checkout process to place an order. What stores are selling APPLE Watch Nike Series 3 Cellular 42 mm Silver in brand new condition? Retailers like Argos, offers best retail prices online for APPLE Watch Nike Series 3 Cellular 42 mm Silver. You can buy it for as low as £429.00 online in brand new condition.